Improve predictions of low-mode internal tides and their uncertainties at small horizontal scales and in coastal regions. Better identify the global distributions of coherent and noncoherent internal tide energy. Constrain the geography of internal tide dissipation. Identify methods of integrating SWOT data with a global internal tide model. Figure 1. Snapshot of mode-1 M2 surface displacement [cm] from a 1/25° simulation. The vertical modes Φn(z) and eigenspeeds cn are determined from global stratification (Locarnini et al., 2010; Antonov et al., 2010) and bathymetry (Smith and Sandwell, 1997) via the standard eigenvalue problem, which is solved using an efficient spectral method (Kelly, 2016). When n = 0 and the coupling coeffients are ignored, the system reduces to the Laplace Tidal Equations. In practice, the surface tide is treated as known, and TPXO.8 velocities (Egbert et al., 1994) are prescribed to force the internal tide. The equations are discretized on a spherical c-grid (omitting the poles) and stepped forward using an explicit Adams-Bashforth algorithm. When the model is configured with only a few vertical modes, it can be run on a desktop at 1/25° resolution, however memory usage increases sharply at higher resolution (Table 1). Table 1: CSW's approximate computational demands for different resolutions. Preliminary estimates of global M2 internal-tide generation below 100 m are also shown. They are less than the 0.8 TW of deep-ocean surface-tide dissipation reported by Egbert and Ray (2003). The saturation of mode-1 generation at higher resolutions suggests that modes higher than n=4 may account for missing 0.16 TW of generation. So far the project has largely focused on verifying and improving technical aspects of CSW. The base CSW source code (C+MPI with Matlab pre/post processing scripts) is now stable and will be released on Bitbucket (https://bitbucket.org/smkelly/csw) later this summer, once documentation has been added. Substantial effort has been devoted to writing efficient code that can be executed rapidly with minimal computational resources. A spectral algorithm (Kelly, 2016) now computes vertical modes and eigenvalues more accurately and efficiently than widely employed finite-difference algorithms. Despite this improvement, pre-processing remains a bottleneck for running simulations with different background conditions. I.e., calculating eigenvalues and topographic coupling coefficients requires approximately 5,000 cpu hours for each snapshot of stratification on a 1/100° grid. Simulations with evolving stratification may require the use of eigenvalue perturbation techniques, although such methods remain untested in CSW. CSW estimates of regional internal-tide generation (Kelly et al., 2016) have compared favorably with those of the MIT general circulation model (MITgcm; Marshall et al., 1997). However, a recent comparative study of satellite, in situ, and simulated SSH in the Tasman Sea has further validated CSW. The Tasman Sea has a strong unidirectional horizontal "beam" of internal tide energy, which originates along Macquarie Ridge (southwest of New Zealand) and propagates about 1500 km to the northwest before striking the island of Tasmania (e.g., see Fig. 1). In January 2015, in situ observations of temperature and salinity were collected at eight 30-h CTD stations and one 40-d mooring. The stations formed two "cross-beam" lines separated by approximately 150 km. Waterhouse et al. (2017) derived estimates of mode-1 M2 SSH amplitude and phase by (i) fitting depth profiles to vertical modes, (ii) harmonically fitting data to the semidiurnal frequency, and (iii) estimating each station's M2 amplitude and phase by using the 40-d mooring record to correct for the spring/neap cycle. For comparison with the in situ data, Zhao et al. (2017) fit plane waves to satellite data without high-pass filtering across the internal tide beam. These fits to "raw data" led to a significant increase in SSH amplitude, which compared much more favorably with the in situ data. Lastly, CSW was run with World Ocean Atlas stratification and forced by TPXO.8 surface tides. The data were compared by extracting satellite and simulated SSH amplitude and phase at the 8 locations of in situ sampling. These data were then fit to a to plane wave, which in all cases explained > 80% of the variance. The satellite, in situ and model estimates of SSH all indicate a plane wave with an amplitude of 1:1 +/- 0:2 cm and a heading of about 140° counterclockwise from east (Figure 2). The satellite, coherent in situ, and simulated mode-1 M2 amplitudes are statistically indistinguishable. Although, incoherent mode-1 tides from the 40-d mooring record have an rms amplitude that is about 20% of the coherent M2 amplitude. These results affirm the accuracy of Zhao et al. (2017)'s plane-wave fitting analyses and the implementation of internal tide generation and propagation dynamics in CSW. They also suggest that robust co-tidal charts of coherent mode-1 internal tide are feasible. Internal-tide sensitivity to model parameters: A first-order analysis using CSW will examine how sensitive the internal tide is to model dissipation, stratification, resolution, bathymetry and surface tides. These analyses will build upon the recent work by Niwa and Hibiya (2014) and Buijsman et al. (2016), who examined internal-tide energy balances in coarser-resolution global general circulation models. Internal tide coherence: CSW simulations with evolving stratification and meanflows, estimated from satellites or global circulation models, will help determine the distribution of the incoherent internal tide (Zaron, 2017) and identify the prospects for removing it from SWOT data. Figure 2. Plots of mode-1 M2 amplitude (top) and phase (bottom) from the Tasman Sea. 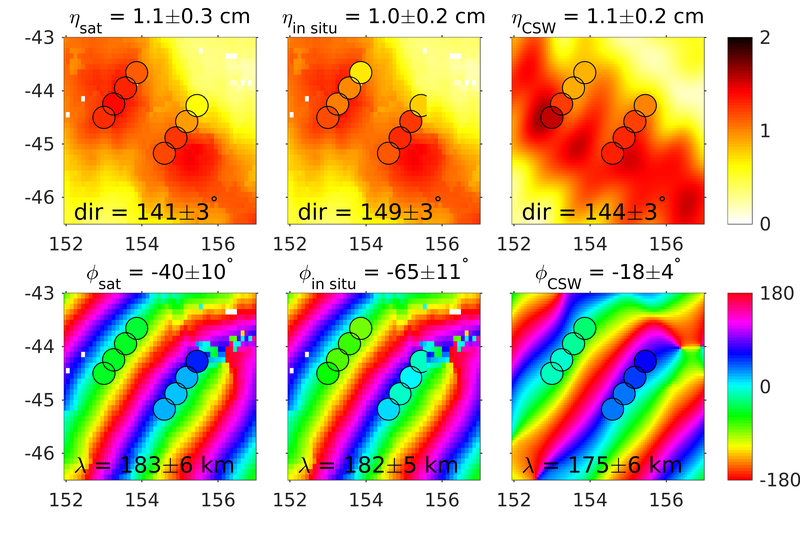 Background colors in the left and center plots are from satellite data, background colors on the right are from a CSW simulation. Colored dots show satellite (left), in situ (center) and simulated (right) values located at the 8 sites that were sampled during January 2015. Reported amplitude, phase, direction, and wavelengths are determined from a least-squares fit to a plane wave. Inverse modeling with the CSW: CSW's dynamical equations are an extension of the Laplace Tidal Equations (LTE). Egbert et al. (1994) combined the LTE with data to greatly improve surface tide predictions. The prospect of combining CSW with data to improve internal-tide predications is attractive, but the details and benefits of such a calculation are uncertain. Antonov, J.I., et al., 2010: World Ocean Atlas 2009, Volume 2: Salinity. Noaa atlas nesdis 69 ed., U.S. Government Printing Office, 184 pp. Buijsman, M.C., et al., 2016: Impact of parameterized internal wave drag on the semidiurnal energy balance in a global ocean circulation model. J. Phys. Oceanogr., 46, 1399–1418. Egbert, G.D., A.F. Bennett, and M.G.G. Foreman, 1994: TOPEX/POSEIDON tides estimated using a global inverse model. J. Geophys. Res., 99, C12 24,821–24,852. Egbert, G.D. and R.D. Ray, 2003: Semi-diurnal and diurnal tidal dissipation from TOPEX/Poseidon altimetry. Geophys. Res. Lett., 30, 1907, doi:10.1029/2003GL017 676. Kelly, S.M., 2016: The vertical mode decomposition of surface and internal tides in the presence of a free surface and arbitrary topography. J. Phys. Oceanogr., 46, 3777–3788. Kelly, S.M., P.F.J. Lermusiaux, T.F. Duda, and P.J.H. Jr., 2016: A coupled-mode shallow-water model for tidal analysis: Internal tide reflection and refraction by the Gulf Stream. J. Phys. Oceanogr., 46, 3661–3679. Locarnini, R.A., A.V. Mishonov, J.I. Antonov, T.P. Boyer, H.E. Garcia, O.K. Baranova, M.M. Zweng, and D.R. Johnson, 2010: World Ocean Atlas 2009, Volume 1: Temperature. Noaa atlas nesdis 68 ed., U.S. Government Printing Office, 184 pp. Niwa, Y. and T. Hibiya, 2014: Generation of baroclinic tide energy in a global three-dimensional numerical model with different spatial grid resolutions. Ocean Modelling, 80, 59–73. Smith, W. H. F. and D.T. Sandwell, 1997: Global sea floor topography from satellite altimetry and ship depth soundings. Science, 277, 1956–1962. Waterhouse, A. F., S. M. Kelly, Z. Zhao., J. A. MacKinnon, J. D. Nash, H. Simmons, D. Brazhnikov, and L. Rainville, 2017: Direct observation of the Tasman Sea internal tide beam. J. Phys. Oceanogr., 47, submitted. Zaron, E. D., 2017: Mapping the nonstationary internal tide with satellite altimetry. J. Geophys. Res., 122, 539554. Zhao, Z., M.H. Alford, H. Simmons, D. Brazhnikov, and R. Pinkel, 2017: Satellite investigation of the m2 internal tide in the Tasman Sea. J. Phys. Oceanogr., 47, submitted.